Cell Therapeutics Inc., a biopharmaceutical company in Seattle developing cancer treatments, says the U.S. Food and Drug Administration lifted a six-month hold on tests of its experimental drug tosedostat to treat blood-related cancers. The intermediate-stage clinical trial is testing the drug in elderly patients with newly diagnosed and relapsed acute myeloid leukemia and high-risk myelodysplastic syndromes. The trial, sponsored by and conducted at Fred Hutchinson Cancer Research Center and University of Washington in Seattle, is testing the new therapy in combination with chemotherapy drugs cytarabine and decitabine. In June 2013, FDA halted new enrollments in the trial after a patient died from myocarditis, an infection causing inflammation of the heart muscle. Acute myeloid leukemia is a cancer that starts in bone marrow, but quickly moves into the blood, then other organs, including the lymph nodes, liver, and spleen. With this disorder, abnormal white blood cells accumulate in the bone marrow and interfere with the production of normal blood cells. American Cancer Society says nearly 15,000 new cases were expected to be diagnosed in the U.S. 2013, with some 31,000 living with the disease or in remission. In myelodysplastic syndrome, bone marrow does not make enough healthy red, white, or platelet blood cells, resulting in immature blood cells, called blasts, that die in the bone marrow or blood stream. The abundance of dead immature cells reduces the volume of healthy blood cells, resulting in anemia, infection, and more frequent bleeding. Tosedostat is a compound that inhibits amino acid peptides in blood cancer cells from making proteins needed to sustain the tumors. 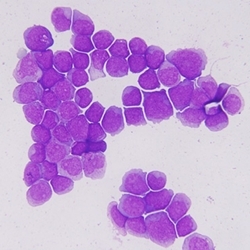 An earlier clinical trial testing tosedostat in elderly patients with advanced acute myeloid leukemia showed 22 percent (16 of 73) of the patients responding to the treatments and another 29 percent (21 of 73) having their disease stabilized. The trial reported the drug was generally well tolerated, with mild to moderate adverse effects. Cell Therapeutics is developing tosedostat in collaboration with Chroma Therapeutics in the U.K. Cell Therapeutics has seven other therapies in clinical trials, including one compound — pixantrone — approved conditionally in Europe to treat non-hodgkins lymphoma.